Another Yu-Gi-Oh! anime has come and gone and now it's time for the 5th installation ARC-V. The story is set in Maiami City on the coast of Japan. Leo Corporation is run by its president Reiji Akaba. Thanks to the spread of the company's "Solid Vision with mass," "Action Duels" are born in Maiami City and has reached worldwide popularity. Children look up to star-level Pro Duelists, and they learn Summoning and Duel styles at various large and small cram schools, including the Yushu Juku that Yuya attends and the largest such school, Leo Duel School (LDS). Yuya Sakaki: An 8th Grader who loves to entertain others. He’s a bit short, but he has a resilient and spry body, and he’s honing his skills in Action Duel at Yushu Juku . His dream is to become an “Entertainment Duelist” who makes everyone smile, just like his father! The sparkling pendant he wears is his lucky charm. Yuzu Hiiragi: Yuya’s childhood friend who often cheers him on and encourages him. She’s a powerful and level-headed girl. The school of Yushu Juku is run by her father, where she and Yuya study Action Dueling. Her Special Skill is being a Tsukkomi with a Harisen. Reiji Akaba: The President of “Leo Corporation”, a major company in the city of Maiami. He possesses a genius-level intellect, and is a Super-Elite Duelist to boot. He is the youngest Duelist in history to be certified to Duel in the Professional Circuit, at age 15. Shiunin Sora: Interested in the Pendulum Summon Yuya does in his Duels, this mysterious boy decides to become his apprentice. He’s so cute that everyone falls madly in love with him!? 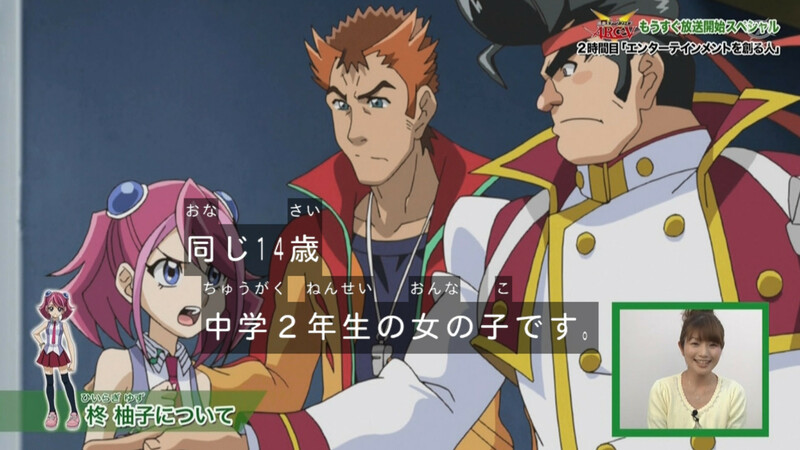 With the 1st episode, "Swing, a Pendulum of Souls" coming in time I believe now is the accurate time to discuss our feelings about the series and begin a passionate debate which we will surely look back on when ARC-V comes to an end in a few years. I really like the sound of Arc-V so far. Yuya sounds like he has potential for being a good lead with some solid development, Action Duels sound like they can be a fun way to shake things up and I'm so glad that the series will include different kinds of monsters instead of being focused on primarily one kind of monster. 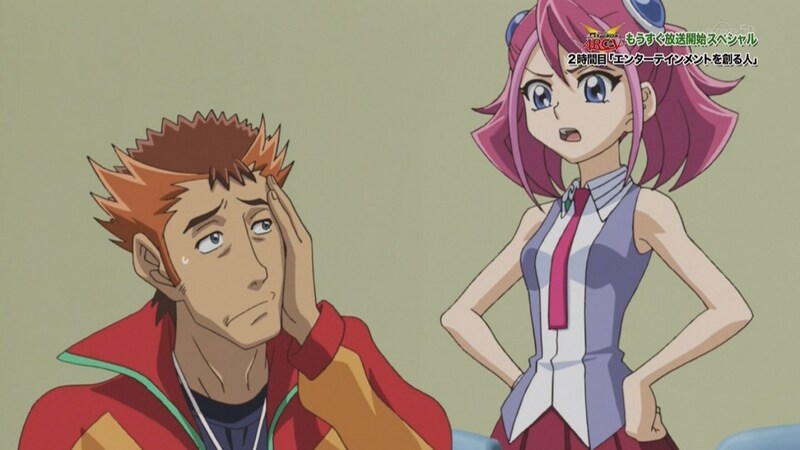 While all of the spin-off series focused on a specific kind of monster, I thought that that was especially problematic for Zexal considering how nearly every duel involved Xyz monsters with little to no variations. It also didn't help that most of the duels came down to spamming ace monsters. I like most of the character designs. Yuzu's design initially made me think of Kotori 2.0, but hopefully she will have more of an interesting personality and she should be dueling considering that the school is run by her father and she studies with Yuya. I don't think that dueling can automatically make a character good, but hopefully it can be used well to give Yuzu some development. Reiji's design and information just made me think of Kaiba automatically. All he needs is the traditional three thousand attack point dragon, which he will most likely get, and a little brother that he is protective over and he couldn't be more of blatant attempt to make their own Kaiab if they tried. Still, hopefully he'll be more interesting when the show finally starts. So far, most of the news for Arc-V has left me feeling pretty excited for the series' premiere. Zexal's pre-release information didn't really turn me off, but it didn't get me excited either. So, hopefully this series will be really good. *Angrily opens mouth. * JK, suckaz!!!! I really like the sound of Arc-V so far. Yuya sounds like he has potential for being a good lead with some solid development, Action Duels sound like they can be a fun way to shake things up and I'm so glad that the series will include different kinds of monsters instead of being focused on primarily one kind of monster. Yeah, I like the whole smiling to escape the harsh realities of life. I Hope he gets a good personality, and some good development. I really like how he's dueling to entertain others, and I Hope they give it some good attention, as it's one thing I noticed that seems to set him apart from other protags already. Yuzu's design initially made me think of Kotori 2.0, but hopefully she will have more of an interesting personality and she should be dueling considering that the school is run by her father and she studies with Yuya. I don't think that dueling can automatically make a character good, but hopefully it can be used well to give Yuzu some development. I would literally cut of an arm for them to make her a character treated equally to the male ones at this point -_- . But also, what's with the jumbo Astral gem things in her hair? Okay, so here’s a list of my Hopes for Arc-V (semi-serious, semi-for teh lulz, if you get me). I call this the Niji Scale of Yu-Gi-Oh! Series Excellence! It’s basically stuff I like to see/ would like to see in a YGO series. - Can Vecty pls have a cameo? - Maybe not ruining mah life? To be honest I am loving the new character designs. 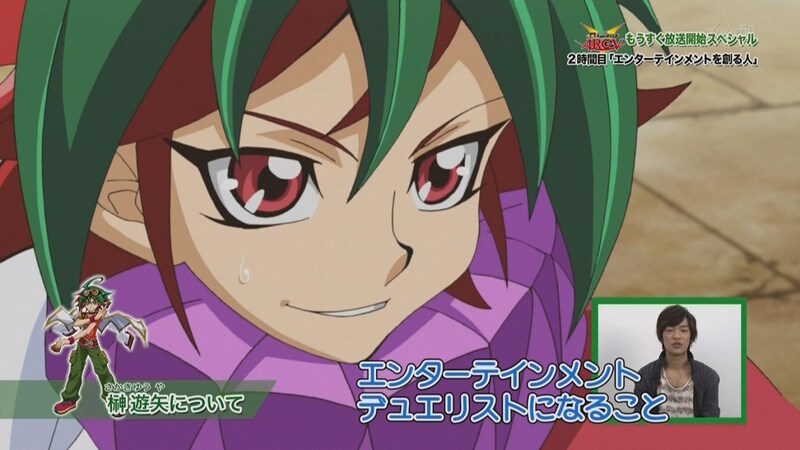 In my humble opinion Yuya, Reiji and Yuzu look better then Yuma, Kite and Kotori to me. 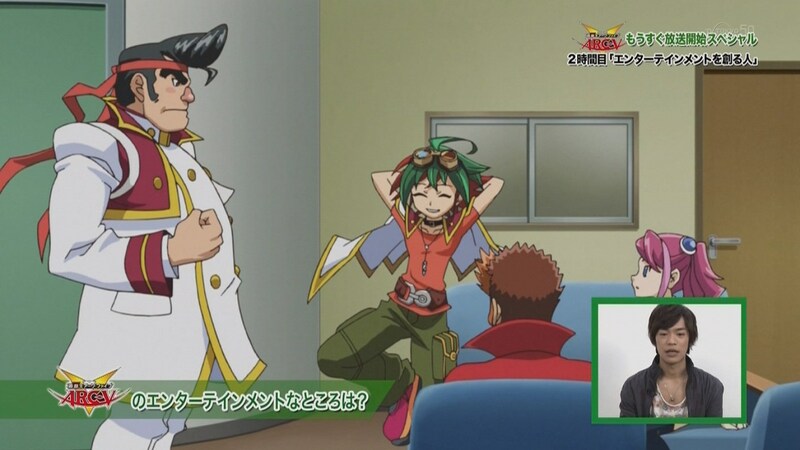 Here are some screenshots from the pre-ARC-V special. Also for anyone interested here is a spoiler of how Episodes 1's duel turns out. - Yuya Summons "Discover Hippo" in Attack Position (800 ATK) and ends his turn. - Ishijima activates a Spell Card that summons "Swamp Battleguard" and "Lava Battleguard" from his hand. - King attacks Hippo, but Yuya uses the Action Card "Miracle" which has the same effect as Half Unbreak. - Ishijima sets 2 cards face-down and ends his turn. 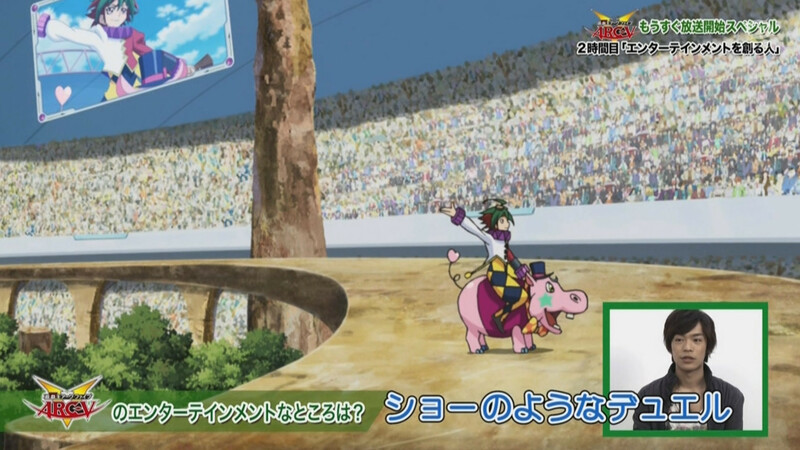 - Yuya Tributes his Hippo for "Odd-Eyes Dragon" (2500 ATK). - Yuya activates a Continuous Spell Card, Balloon something or other, which can low a monster's ATK by 1000 if you send a card from your hand to the Graveyard. 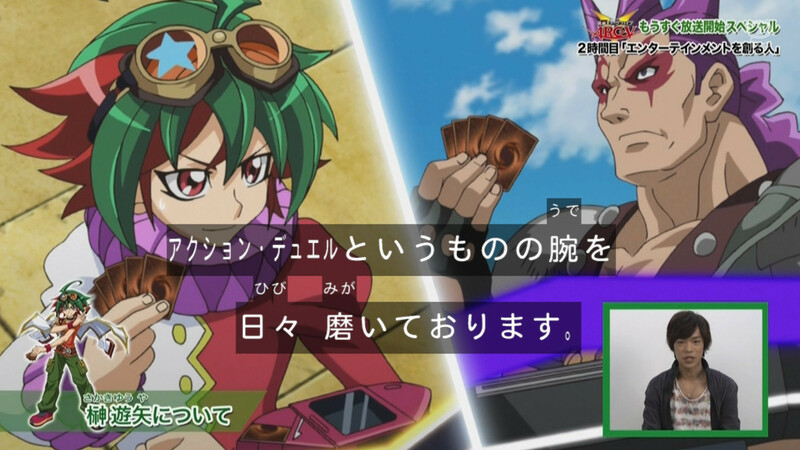 - Yuya discards 3 of his Action Cards as a cost to drop King to 0 ATK, and then has Odd-Eyes attack. - Ishijima activates his own copy of "Miracle", then using one of his Set Cards, Barbarian's Attack shoots up to 5000 until the End Phase. - Guy watching doesn't remember much here... during the Battle, one of the set cards is used, bouncing Odd-Eyes back to the hand. Yuya only has 400 Life Points, while Ishijime has his Life Points restored to roughly 4000. - Yuya experiences an awakening, as his Magicians and Odd-Eyes turn into Pendulum Monsters. - Yuya places Chronomancy and Astromancy in their Pendulum Zones, and summons his 3 monsters with Pendulum-Eyes at the center. He has no other cards in his hand or field. Arc-V looks interesting. Hopefully it'll be able to hold my interest, something which ZEXAL failed to do. ZEXAL was not that bad in my opinion but the fact it lowered most people's standards probably helps contribute to the hype for ARC-V. Plus let's be honest the visuals for ARC-V look amazing in comparison to ZEXAL's lower tier visuals from its first few episodes and the better the visuals the more interested people would be in seeing it. While Zexal is still my least favorite Yu-Gi-Oh! series out of the four completed series, it did improve and I grew to like it still. That being said, I can definitely see why it wouldn't hold people's interest. I think that a major factor for that was the first few episodes. While I think that the first duel between Yuma and Shark was good and setup the plot fairly well, the rest of the episodes until their rematch in episode ten were pretty bad. They dragged the duels far too long, the characters that they introduced in those episodes were all unnecessary in the grand scheme of things in my opinion and what little advancements in the plot we had weren't really worth most of those duels being two-parters. 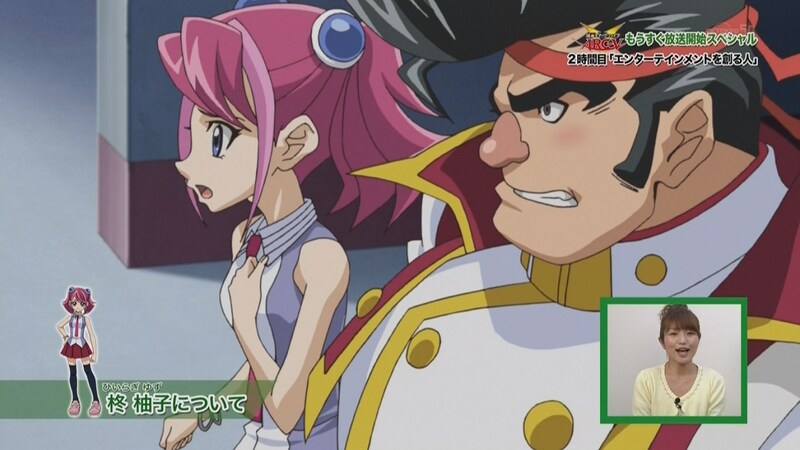 Compared to the other series' first ten episodes, I think that Zexal start was really lackluster. Not to mention the pacing for the first couple of arcs in general were pretty bad for me and most of the characters weren't particularly interesting either. That's one reason why I'm hoping that Arc-V has a good start. If the first chuck of episodes of any series are weak, drag on or are boring, then that would just turn off a lot of potential viewers right from the start. Having a good start can help to grab more people's attention and it could show signs of how good the series can potentially be down the line. The special for Arc-V was pretty fun. I was hoping for more clips from the show, but what we did see was pretty good. 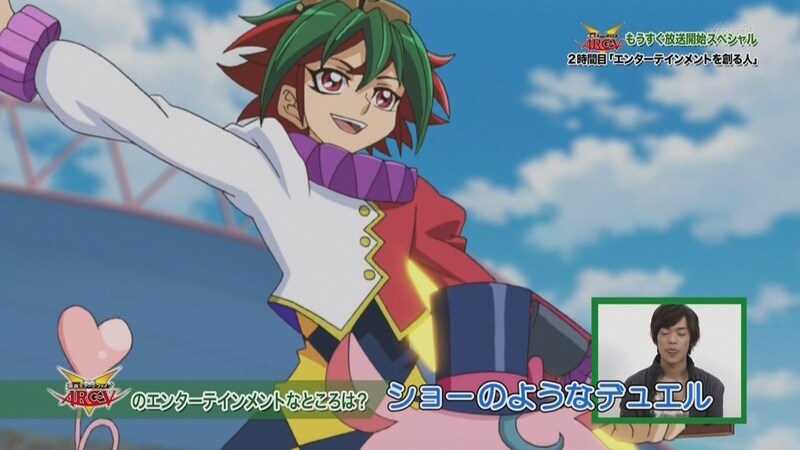 I really like Yuya's design and seeing him ride the pink hippo while dueling is just so ridiculously adorable that I can't help but love it. 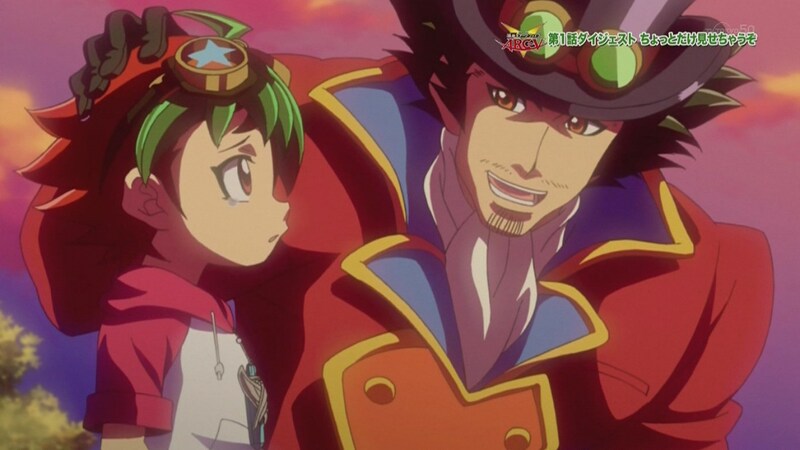 His father also looks like a circus ringleader, but I imagine that's suppose to tie into how he inspired Yuya's dream to become an Entertainment Duelist. I'm still excited for the series and hopefully will enjoy its premiere episode later this weekend. The first episode was solid in my opinion. The way how it felt like we entered right in the middle of these characters lives was cool and Yuya and Yuzu were really endearing to me. The other characters were good as well and I like how professional the episode began with having managers and endorsements, it was a nice parallel to how professionally 5D's started. The duel was good and I liked the Action Duel concept more then I thought I would mostly because they actually have to look around and catch the cards on time instead of getting a free car without even trying. 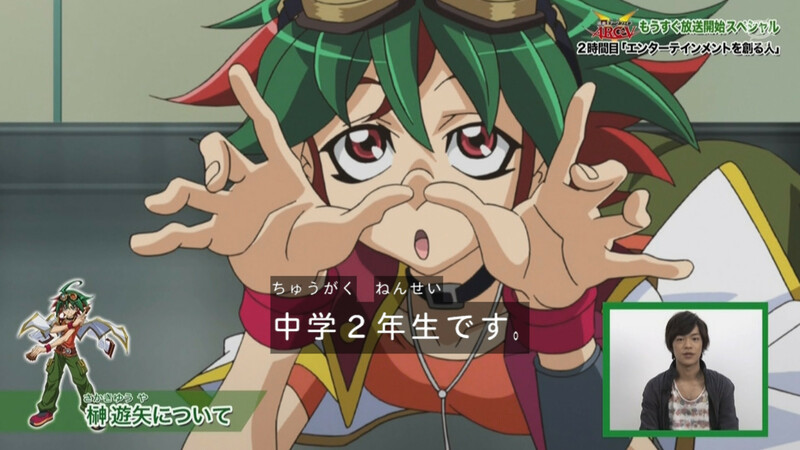 Yuya's Pendulum summoning sequence was awesome and in my opinion I really hope that they become permanent the next time he uses it and that he has a 2nd Odd-Eyes Dragon to spare if his 1st one permanently becomes Odd-Eyes Pendulum Dragon. Overall it was a solid first episode and was better then GX, 5D's and ZEXAL's first episodes. Also, if I understood the episode right, did Yuuya invent pendulum summoning? Anyway, I haven't been into Yu-Gi-Oh since the end of 5D's first season, but the episode caught my interest for being really fun and entertaining to watch, so that's nice. Sort of want to re-watch the other series now too. Yep he basically invented it. Well at least until the villains reveal themselves and casually act like Pendulum summoning has existed for ages. I really hope that the blonde guy who showed up in the opening with what seemed to be 3 copies of 1 monster ends up being the 3rd member of ARC-V's power trio. He really looks cool and the opening made him and Reiji look like legit competitors. After watching the first episode in 3 second increments, I would say they handled it better than Zexal's but idk by how much since my vid was screwed up. AT least no more 5000 attack aces on the first duel this time. AT least no more 5000 attack aces on the first duel this time. Yuya's opponent had raised their ace monster's attack to 5000 ATT at the end of the episode though. I liked the Opening Song (especially when it got sort of a dark, trippy sound during the Pendulum Summoning scene), but I wish they showed off more of the characters. Besides the two antagonists flashing by, it was all just Yuya's Monsters and his friends. I like how GX, for instance, had it show off a bunch of the characters' decks in the OP. I thought that this was a really solid first episode. The opening theme had a really cool beat to it with some nice images, while the ending theme was a nice light-hearted song to end the episode with. Yuya is just so likable to me already. They establish his personality so nicely. He looks like he can be pretty laid back, clearly a clown and enjoys providing entertainment, but he is also hiding some sadness inside of him and acts that way possibly to cope with those feelings. There is still a lot of good potential with his character and I just love that. I also like how even though he rides on a pink hippo dressed as a clown, they didn't make him too goofy or idiotic. That was one of my problems with Yuma when Zexal started since he was too stupid for me to consider him funny. So far, they haven't done that with Yuya and I hope that continues. The other characters didn't really stand out that much to me, aside from Yuzu, but they did just jump right into their lives and the focus is all on Yuya, so they'll probably get some attention later on. The Action Duels look pretty fun. 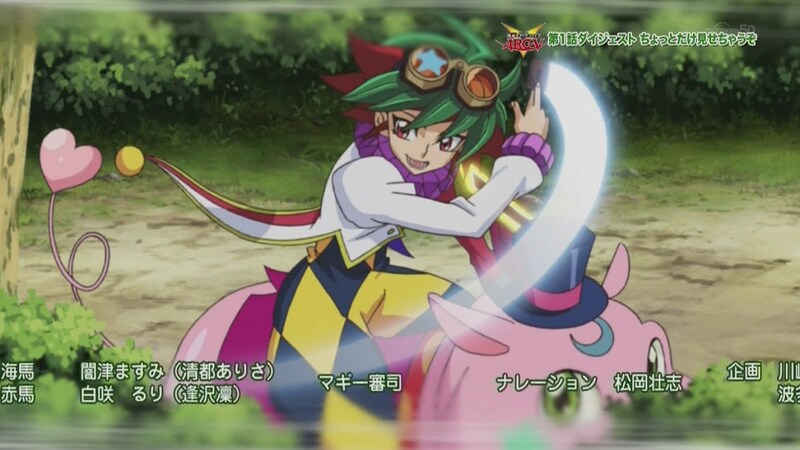 I love seeing Yuya ride on his pink hippo. It's just too ridiculously adorable for me. I also loved seeing the hippo jump in the air, being sacrifice in mid-air for Odd-Eyes and Yuya jumped onto his dragon's back. That was awesome. I'd love to see more cool summoning scenes like that in Action Duels. It also makes me think that Action Duels would be seriously fun to play in a video game. As for the Action Cards, I'm kind of mix on them. It does feel kind of cheap for people to just use a card outside of their deck and it can be used to get out of tight spots pretty easily. 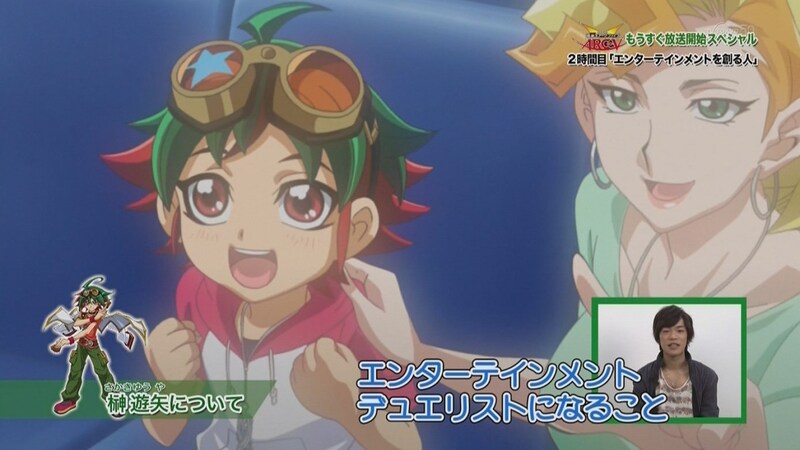 On the other hand, they still have to work in order to grab the card in time and Yuya did have some good strategies with Action Cards during the match. I'll see how I feel about them after a few episodes. Yuya creating Pendulum Monsters with his magic pendant seemed much more cheap to me. I was expecting that Pendulum Summoning was already established in the series, but apparently it wasn't. The summoning itself looked really cool though. 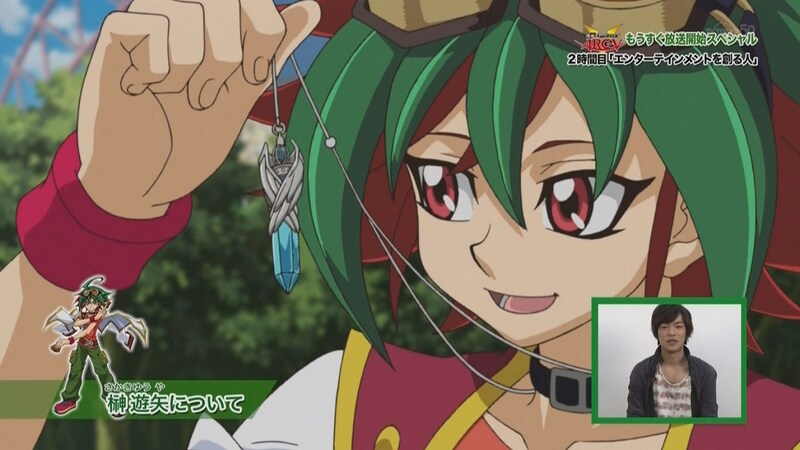 I'm sure that the magic pendant allowing Yuya to create Pendulum Monsters is connected to the plot. I just hope that he won't be the only character with Pendulum Monsters in the series for too long. Arc-V has left a really good first impression. I liked the way the first couple of episodes in Zexal set things up, but this first episode has left me more excited than the first episode of Zexal did and I really hope that Yuya remains so likable. I'm quite eager to see where the story and his character goes in this series, so I'm quite happy with the show so far. My bad, in my defense though my vid was playing at 3 seconds pause 3 seconds pause the whole time. I first actually thought his father had already used Pendulum Monsters since the pendent was apparently his. I wonder if his father knew anything about the power of the pendant... It is pretty cheap, but what would be the cheapest for me is Yuya already beating a Pro Duel champion in the first two episodes of the series, which is really likely to happen considering the effects of the monsters he summoned and how the main protagonists so far haven't lost their first full duel. I know it would set up for Yuya to go to the bigger school, but he should still be able to join in the Leo Duel School without having to beat Strong for using Pendulum Monsters alone. Even though it's true that Strong didn't beat Yuya's father and only became the champion because his father didn't show up, it's still cheap as to get to the finals and keep the title he had to naturally fight many duelists. That's possible that his father knew about the power of the pendant, or at least I could see some connection between its power and his disappearance. As for Yuya winning, that's probably a guarantee. I doubt that they'd want to show him losing the first full duel of the series, especially after he created Pendulum Monsters. Joining the Leo Duel School just for creating a new kind of monster makes sense, but winning with a brand new kind of monster would grab more attention and praise. 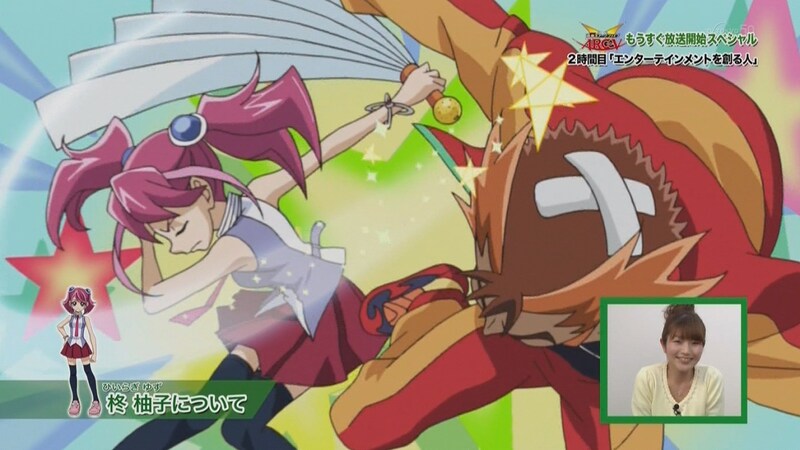 Besides that, I don't mind the idea of Yuya defeating a champion duelist in the first match of the series. It's not significantly different from Yugi defeating Kaiba in the first episode of DM in that regard. Plus, it's fairly typical for the protagonist to defeat a stronger opponent within the first few episodes in order to give the impression that they're the underdog overcoming challenges. The only cheap part of Yuya's victory would be that it most likely will be due to the Pendulum Monsters that he just magically created. I'm not sure if Yuya would get Strong's title in this match when it seemed more like a random challenge rather than a title match to me, but I haven't read any translations for the episode yet, so I could be mistaken about that. It's a relief for me to be able to be excited about more character development and adventure next week, rather than wondering who's gonna die next XD . I was overall really pleased with the first episode! I like how the aesthetics of the show have the vibrant futuristic element of ZeXal, but with dark and natural color balancing it out nicely. BUT I MISS EVERY GUY WEARING BELL BOTTOMS!!!! YOU THINK THIS IS A JOKE? YESTERDAY I WAS SO UPSET I EVEN WENT OUT AND BOUGHT MYSELF A PAIR!! 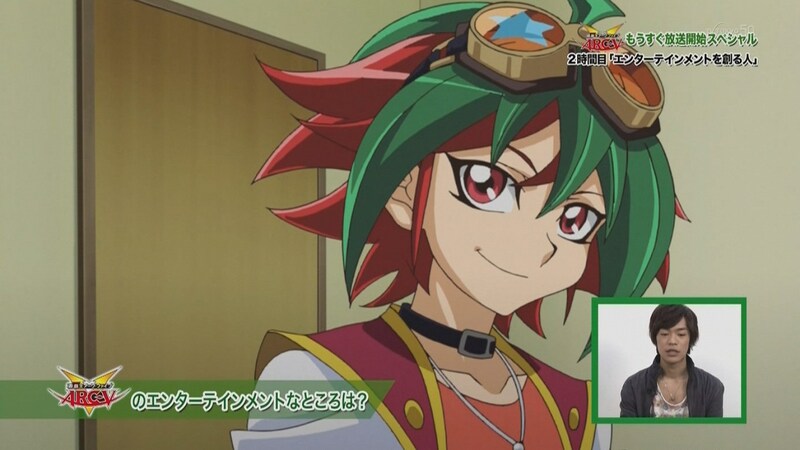 I'm loving Yuya (who sometimes be known as the clown, or my tomato dream girl). Right now he seems like a little of Judai's chill attitude, and a little of Yuma's happy-go-lucky-exterior-with-troubled-interior, but with a lot of interesting new elements and potential. I really like his emotional vulnerability, and the interesting potential it has. His passion for entertaining people, rather than just dueling, is also really interesting. It seems like he really loves making people smile, or maybe wants to feel better about himself, or both. Either way, him soaking up the attention was pretty cute :3 . I think Yuzu's off to a great start too !! KEEP IT UP, WRITERS!! GIVE ME CHARACTER DEVELOPMENT, OR GIVE ME DEATH!! I know it's early to be talking about impressions, but going with the love-child theme, she seems like a bit of a blend of Kotori (while her writing still gave her a little depth, and while she still had a chance of development aside from being the cheerleader and childhood friend) and Rio (before she was treated mainly a damsel in distress). She's girly, and did have a moment of worrying about Yuya, as well as the whole comically-slapping-the-sense-into thing, but it's balanced out with her not being shown as cutesy and pouty all of the time, as well as dueling in a show about dueling. On top of that, she also has some super-cool "ice queen" moments of demonic wrath, and I absolutely adored (*cough*and would love to see more of*cough*) not just the comedic little feminine smacks, but actually losing her temper and breaking the keyboard XD ! If they keep it a cool balance and don't lapse too much into the "Kotori" elements of her (not that I think those parts are inherently bad, just a character 100% that isn't very appealing to me), and keep the "Rio" elements (plus the awesome keyboard smash, whatever that was XD ) in there, as well as flushing out her character by giving her some background and challenges, I can likely see her becoming one of my favorite female YGO characters! I'm certainly really loving her screen time currently (that may be partially because I'm very used to ZeXal ). BEEERIEVE BEEEERIEVE!!!!!!!!!!!!!!!!!!!!!!! Yeah, the ending was nice (it also reminded me of the 3rd ED of ZeXal), but I'm loving the OP! Dat awesome song with dat nice animation (all the vertical divisions of the screen with the colors reminded me of the 5th ZeXal OP a bit). The trippy part was probably my favorite. Those were my thoughts exactly! I was a bit surprised by how few were shown, but it's still early in the show. I Hope it means they'll get more focus, then. Yeah, the fact they weren't shown with cards might be a bit worrisome. I really Hope they get good parts in the story. And I Hope they keep his ~Chea-ting za Gemu~ to a minimum! It would be nice to at least have less of it than in ZeXal (although I'm not a very good judge of duel quality). If they have XYZ, Syncrho, Fusion and Ritual it should be interesting.